A PORTRAIT OF JAMES MACTAGGART MANAGER AT ISLE OF ARRAN DISTILLERY. 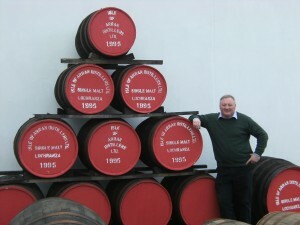 James MacTaggart is Manager and production director at Arran Distillery, Lochranza, Isle of Arran. 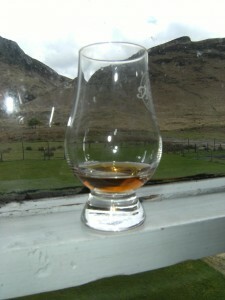 One fine April day I travelled there to talk with James, and sample a couple of their delicious honey and spice drams. James is 59 years old and from Islay (so, fundamentally a good whisky man!) I asked James when and why he started working in the whisky industry. He told me that in 1975 he was working for Strathclyde Regional Council in Bowmore. At that time Harry Cockburn was manager of Bowmore Distillery which was owned by Morrisons. Harry intended to put computers in the distillery office and wanted James to workthere and be the office manager. I thought this was very modern minded of Harry, bearing in mind it was 1975, and not many people saw the value of computers away back then. However, the computers didnt come to pass, but James was offered a job in the warehouse and malt barns, which he took. I asked James if he had a game plan ~ and he answered yes! He told me he has always had ambition, but that many of the people in the distillery were older than him and he was conscious that they would perhaps go up the ladder ahead. I asked him if it had reminded him of the Queen and Prince Charles scenario ~ but he declined to comment! James was headhunted to Arran and started as manager there in 2007. 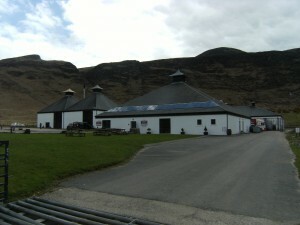 The distillery is new, with the first middle-cut of spirit running through the spirit safe on 29th June 1995. This is the first licensed distillery on Arran since 1836. There are six people on the board and James is one of them. I asked James what is the most important aspect of his job as Manager at Isle of Arran Distillery. He said that its to ensure the continuation of the quality of the spirit they produce. James told me that his favourite thing about the job at Arran is that he is involved in the whole process from start to finish. Because Arran is a small independent distillery he negotiates malt contracts, picks casks for bottling, buys casks for maturation, attends to quality control, directly employs people ~ there is no HR department. James sees the process through from beginning to end. This is very satisfying, but also a huge responsibility. James deals with it all in a quietly controlled manner, but with an undercurrent of humour. I asked James what is the first thing he does in the morning, and the humorous, and truthful answer was ~ gets out of bed! I asked James, how has working in a distillery changed since you first started? He pointed out a very interesting thing. When he was at Bowmore, distilling has changed hugely since he first started. More computerisation, departmentalising of processes, descisions taken in head office and so forth. But , since coming to Arran he feels like he has gone back 30 years! ~ In a good way. The powerbase for the distillery is IN the distillery. James can choose the right person fora job as he knows thesubtlies of the job requirements,and he interviews the people who are applying for the job. He can fit the person to the requirement, rather than taking a person who looks good on paper, but their personality may not match the area of work. Descisions are made by the distillery manager on site, rather than in a remote office somewhere else ~ this is the way distilleries ran thirty years ago, this is the way it works at Arran. James has just taken on two 23 year olds and as he sees it they are going to learn whisky making in a very traditional way. Then, if they want, they can move out into the industry from a very hands on tradional learning background. They have a great future ahead of them. They will encompass both the old and the new. Then, I asked him, ‘whom do you most admire in the industry?’ and his answer was, ‘Jim McEwan. For what he has done in raising the profile of single malt whisky through out the world. Jim, and Richard Patterson. I asked James if he was aware of a difference in the numbers of women drinking whisky and coming todistilleries, now. He said that there is great room for awareness and growth in this area. Arran is in the top five of the most visited distilleries, having close to 60,000 visitors a year. James says they see women taking an interest and coming on tour with their partners/husbands/families. I asked James what he sees as the secret to a great dram. 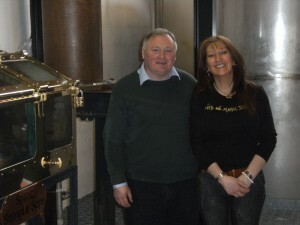 James told me that there are two elements to a great dram ~ quality of new make spirit and quality of cask it’s kept in. I asked him what is his favourite dram and he said that it’s one straight outthe cask in the warehouse. One like that can’t be beaten. I asked what is the distinguishing feature of an Arran dram? The water supply is so pure at Arran, there is no peat at all. The dram is a light aromatic whisky.James said that Arran has a spiceyness. I know what he means ~ it’s like the dram curls round at the end, that’s the spicey bit. I asked James what does he do to relax. He gets a Cal Mac ferry home to Islay! He commutes to Arran weekly. ( I used to work in Jura, and just taking that ferry to your work makes it feel like going on holiday)Not a bad way to view ones job! James approaches whisky making with the head of a businessman. He is very aware of economics and keeps a tight rein on figures relating to litres of spirit per ton of malt. He has increased production of NMS at Arran from 100,000 lts to 400,000 litres. And next year told me they are aiming for a production level of half a million litres. The distillery was designed by an architect and is aesthetically pleasing. 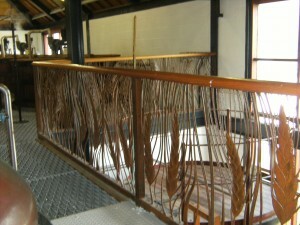 Before coming to Arran, I had not previously seen railings in the working area of a distillery designed for beauty. James told me that they are hoping to expand and the board of directors have big ambitions for the place. So, if they intend to be fitting another Spirit and Wash Still, then the lovely railings will have to go! I asked James what advice he could give to Whisky for Girls. He said the most important thing is you drink the whisky that YOU enjoy, not what people tell you to drink. Everyone has unique and individual taste. It’s what YOU like that it’s all about. ‘ Too long ago ~ I can’t remember (look what age I am! )’ he said. I thought, if he has heeded his own advice for all these years, he will havetasted some pretty good malts in his time! Whisky for Girls had such a good time at the Arran Distillery we are coming back for the Open Day on 30 June 2012 ~ and bringing our friends. See you there!